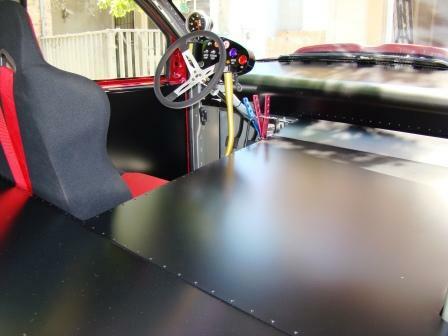 The “BigBadDodge” has a totally custom sheet metal and powder coated interior canopy, including door panels and a custom curved front dash. 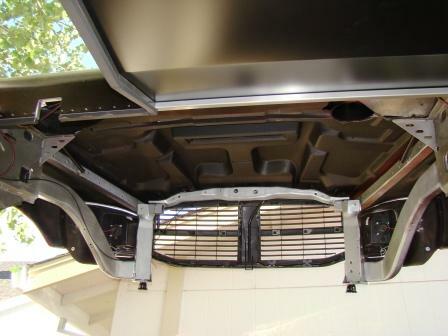 All pop rivets are black to match the powder coating and to give us that neat clean appearance. 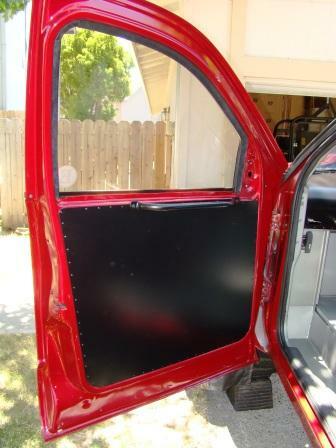 All four doors are operational and the door gaskets are in tack to give that stock appearance and feel when the doors are closed. 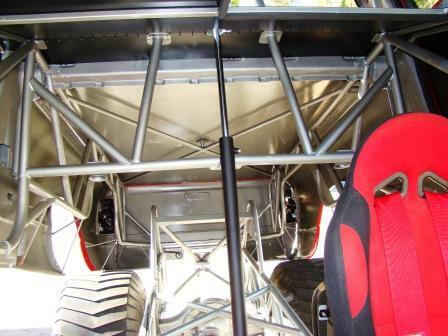 The view looking in from the front driver’s side door; Here you can see the racing seat, SFI rated 5 point harness, removable steering wheel, and in the background the upper frame tubing with hydraulic ram attached used to lift the body. 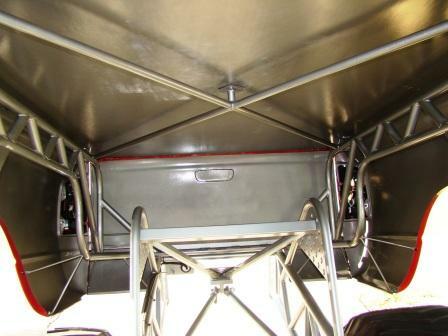 And the view looking in from the passenger rear door; this angle gives you the best view of the custom canopy work, drivers cockpit area, and controls. 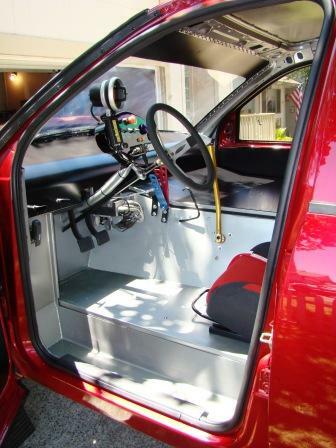 The gold handle is the hand throttle. 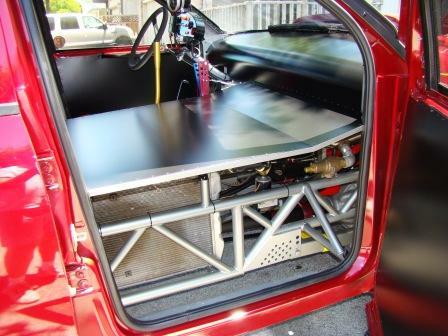 When I upgraded the Corsa Data Acquisition system I also added an Inteli Dash. 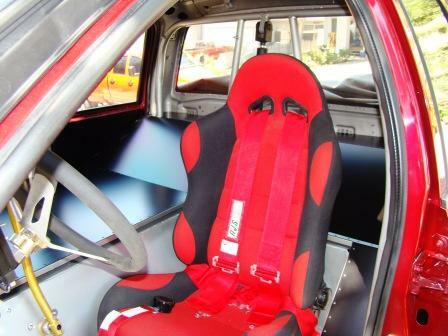 This allowed us to get rid of the bulky Autometer Tachometer, incorporate some water proof Contura switches, and the fire bottle controls, as well clean the dash up a little. 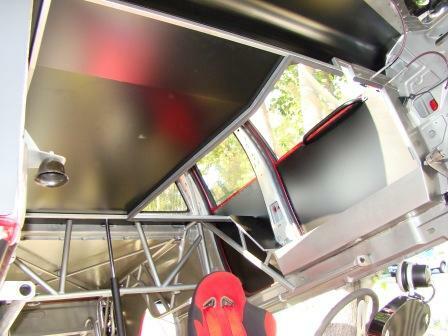 Here are some pictures of the custom billet dash that was made by Designit Prototype.